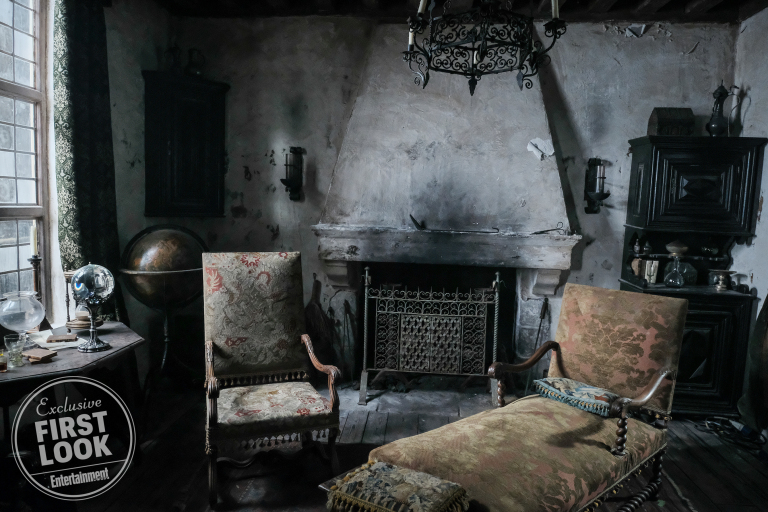 Entertainment Weekly Releases First Look Photos Inside Nicolas Flamel’s House! The latest issue of Entertainment Weekly shines a spotlight on the upcoming Fantastic Beasts: The Crimes of Grindelwald film, and just when fans thought they couldn’t anticipate it more, the new teasers up the ante further. The new edition includes interviews with Claudia Kim, the Maledictus revealed to be Nagini in the final trailer, the casts’ thoughts on working with wizarding world creator and screenwriter J.K. Rowling and exclusive photos of prop master Pierre Bohanna’s wands. The issue also includes a rare interview with Rowling herself and a first interview with Johnny Depp, who portrays the powerful and charismatic antagonist Gellert Grindelwald. 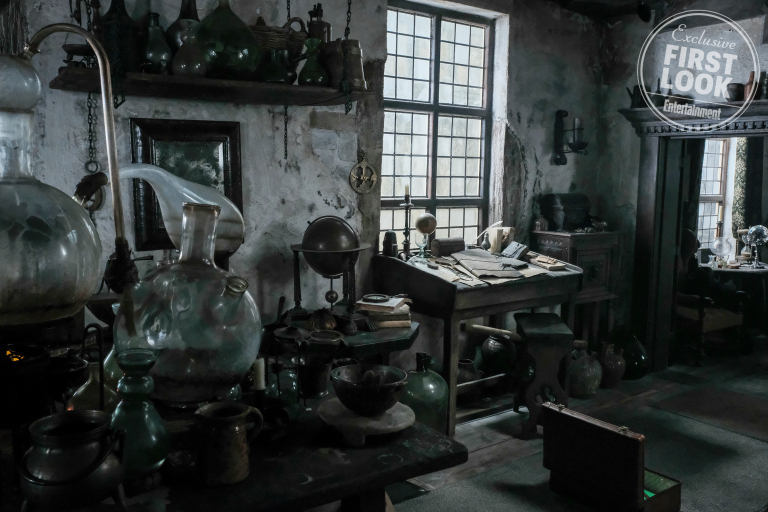 In addition to some incredible new photos of Leta Lestrange, Vinda Rossier and others, first look images of Nicolas Flamel’s house have now been released online as well, plus new interviews with the cast! The most exciting of the images may be the one showing us the Philosopher’s Stone. 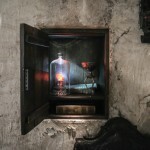 Kept in a wall safe which may have a deceptively-decorative wooden door to throw off nosy visitors, the tiny vault looks to hold a few of Flamel’s most valued possessions. 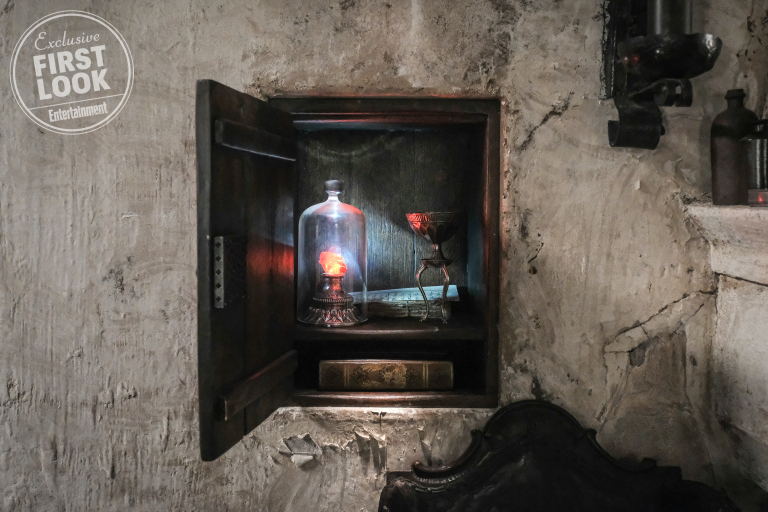 Aside from the stone, kept under protective glass as shown in the screenplay cover art, there are some important notes and papers and a metal dish or goblet set on a pedestal which has a disc for a candle between the metal legs, useful for heating potions or other liquids. Also in the safe is a an old book with gold embellishments. No markings on the spine give its name or usage away, but its likely that it contains spells or formulas of great import to the Alchemist. The magazine also gives a closer look at Flamel’s laboratory. A chemist–or rather, Alchemist–at work, he has a pestle and mortar for grinding ingredients into powder form, tools for fine dicing, numerous glass vials for testing and collecting, various bottles and a scale for achieving precise measurements. As hard as the man may work, his sanctuary also has a place for repose, a chaise and chair in front of the fireplace, quite cozy when crackling along in the winter months, no doubt. Nooks and surfaces are decorated as would be fitting for a man of science and philosophy with globes, beakers, books and a glass ball (for divination?! )–the same ball we saw during our visit to the Crimes of Grindelwald prop department with Pierre Bohanna! This photo reveals a bookshelf full to over-flowing and a glowing glass ball, proving it’s not just another trinket! Fans will also note blocking instructions on the floor, indicting this is a set photo rather than a still from the film. 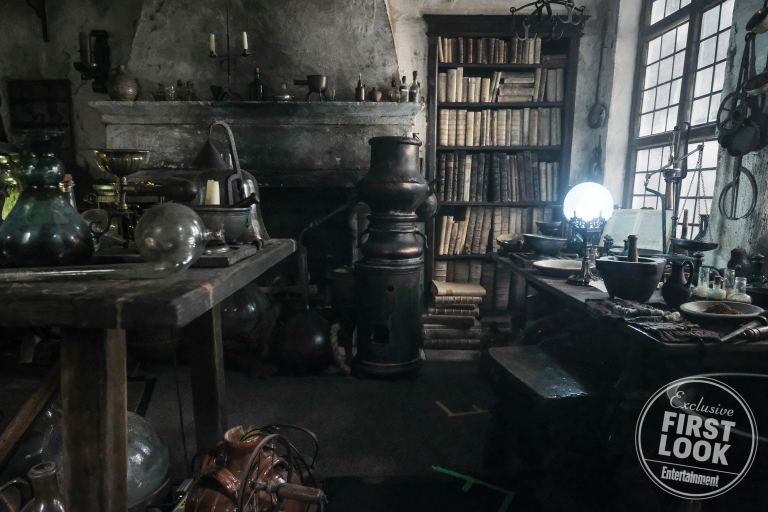 The final teaser photo shows the back of Newt’s trunk, glimpsed from the front in earlier photos as Newt emerges and finds himself inside Flamel’s personal laboratory. 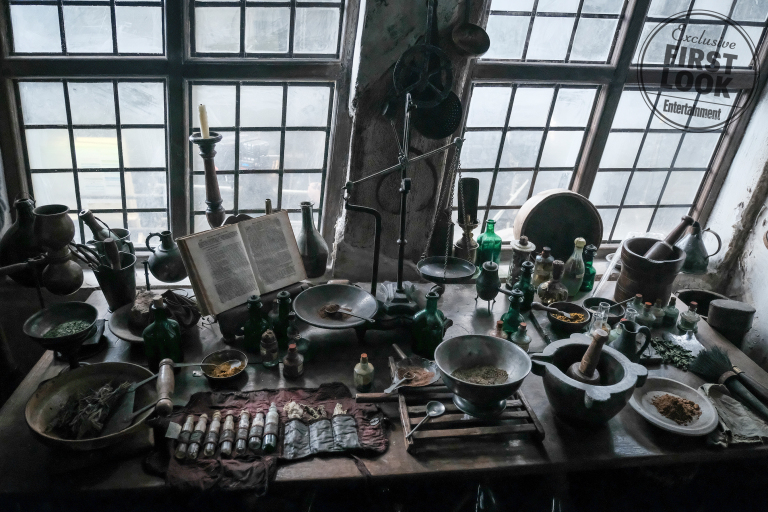 To the immediate left are instruments for producing all manner of potions and other solutions, and central to the lab is Flamel’s desk, covered with yet more papers and notes! In another video, they discuss their favorite wizarding words to say. Eddie Redmayne says ‘Petrificus Totalus’, Katherine Waterston loves to say ‘Mr Scamander!’, Alison Sudol loves ‘Puckwudgie’, Zoë Kravitz loves ‘Muggle’, and Ezra Miller says that casting ‘Riddikulus’ has helped him overcome some fears! This issue is clearly a must-have for fans wanting an inside look into the film and all the treasures it holds, providing ample time to pour over all the details and hints at things to come. Have you picked it up yet? Do you plan to?